Anat Halgoa Solomon is co-founder and CEO of Saturas, a precision irrigation sensor technology for permanent crops. She previously served as CEO of Veolia Water, a water and waste-water treatment firm in Israel and VP at Global Environmental Solutions. Current methods of obtaining an SWP measurement are labor intensive and expensive, according to a Saturas. The company says its sensor is the only one that is embedded in tree trunks, providing direct contact with tree/plant water tissues. This enables an accurate measurement of the water status of the plant and eliminates any inaccuracies that are associated with placing sensors in the soil, or on leaves and branches. The company raised a $1 million second round of funding in early 2016. AgFunderNews caught up with Solomon to learn more about her journey as a CEO after five years in agtech, in this next installment of our female founder and CEO Series. I was born, raised and still live in the northern part of Israel. I hold an M.A. in Organizational Development from the Israeli College of Management Academic Studies and a B.Sc. in Chemical Engineering from the Technion-Israel Institute of Technology. The first 20 years of my career were dedicated to the water treatment and clean-tech industry. Before founding Saturas in April 2013, I served as CEO of Veolia Water in Israel and VP at GES, Global Environmental Solutions. Q: What does your company do and what is its edge? Overwatering puts pressure on an already scarce and expensive resource, increases pollution from nutrient rich runoff, affects the quality of the fruit, and reduces profitability. Stem water potential (SWP) is a scientifically recognized, highly accurate parameter for determining water status in crops. Today, SWP can only be measured in a labor-intensive, manual procedure, pressure chamber. Despite numerous approaches to sensor-based irrigation, including measuring soil and leaf moisture, the market lacks a solution that combines accuracy, ease of use, and affordability. Saturas’ SWP sensing system automatically collects accurate data using a minimal number of sensors per hectare. It transmits the processed data to a friendly user interface on a PC or mobile application. The technology tailors irrigation to the real-time water needs of the crop, resulting in more efficient water use and increased yields, fruit size, and sugar content (e.g., vineyards). Embedding the sensor in the trunk eliminates the common problem of damage to sensors placed in the soil or on the tree/vine. Q: Why did you choose to go into ag and agtech? Once I left Veolia Water I was looking for new challenges in new and fresh fields where I could contribute my extensive experience in technology management and business development. During wide networking meetings that I had at that time, I met with Mr. Zvika Robinshtein who was the CEO of MIGAL Research Institute, specializing in agriculture and biotechnology, and he mentioned the need for a business approach to good technologies and ideas that often fail due to a lack of business understanding and capabilities. After meeting Dr. Moshe Meron, senior researcher at MIGAL institute and the inventor of Saturas technology, I felt that I found my next mission: to take the innovative idea of Dr. Meron and realize it. With Trendlines Agtech incubator platform, this mission became a reality. Q: Why did you launch your company and what are your responsibilities? The world is facing a global food challenge. The increasing population will require a significant increase in food production on less land and with less water. One of the ways to overcome the challenge is precision agriculture. The implementation of cutting edge technologies in the agriculture world is essential in order to increase efficiency and yields. Precise irrigation is one of the most important challenges today. The need to save water, which for some areas has become a necessity together with the need to optimize yield, made precision irrigation one of the top missions. 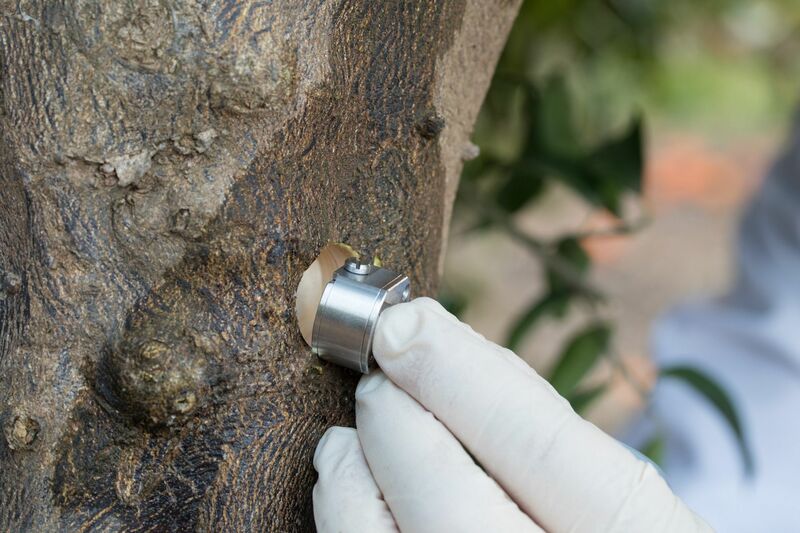 Saturas’ innovative solution provides farmers with a decision support system for precise irrigation based on a miniature sensor embedded in the trunk of the tree in direct contact with the water tissue and measures the water status. As founder and CEO of a young startup company, my responsibilities are broadened. From technological aspects to business development and management. One of the key activities in my role is to choose the best employees to join the team and to help us reach the goals. I believe that one of the most important advantages of Saturas next to the innovative technology is the team. Highly professional and motivated people that fit not only the skills and experience required but also fit the company culture to make it successful and fun. Q: What are your short term and medium goals? The main goal for the coming months is to complete development and finalize the commercial product. We expect to start distribution of the product next year. The innovative technology combines multidisciplinary challenges: mechanical, electrical and plant physiology. Q: What are the next steps for the company? Penetrating the market is the next step. The potential is huge and we are making all the preparation required to execute it. We receive very good feedback from farmers who are anxious to tests our solutions. Q: Why is it an exciting time to be in this space/industry? Agtech is certainly in the spotlight since it is the core of the development and growth of the agriculture industry today. The need to fill the existing gap with advanced and innovative technologies is a driving force in this field. There is a lot of interest from ag companies, investors, and farmers making this industry attractive and exciting. Q: What are some of the biggest challenges for agtech start ups? Besides the obvious challenges that agtech startups face like technology challenges and finance, I think that operating in a relatively conservative market is another big challenge. The average age of a farmer today is close to 60 years old with limited desire to implement high technology and strong beliefs in the way he managed his farm until now. I think that the coming decade will change things due to the entry of young people to the industry who are savvier regarding technology. Q: Why in your opinion are there so few women in agtech? I don’t think that the situation in agtech is different from other technological fields. According to recent research that was published in TheMarker magazine regarding the Israeli market, only 28% of total graduators from engineering, computer science, and mathematics are women, only 23.5% of total R&D positions in high-tech companies are held by women, and only 7.5% of startups founders are women. Speaking from my own experience only, I can say that the change needs to start with women. They need to believe in themselves and to decide that they want to work hard and accomplish their goals. If more women would join the industry we will create the change and make an impact. Q: Being a woman in a male dominated industry, what are some of the challenges that you have faced and how did you tackle them? Frankly, I must say that during all my 25 years of career in a male-dominated industry I have never faced any situation due to me being a woman. I have never felt that something or someone has prevented me from achieving my goals just because I am a woman. I always had the support of my husband and partner regarding the family responsibilities, so both of us could develop successful careers. I believe that strong intuition, sensitivity and a lack of ego — usual female characteristics — have helped me a lot during my career and together with high motivation and determination, have brought me to my satisfying position today.